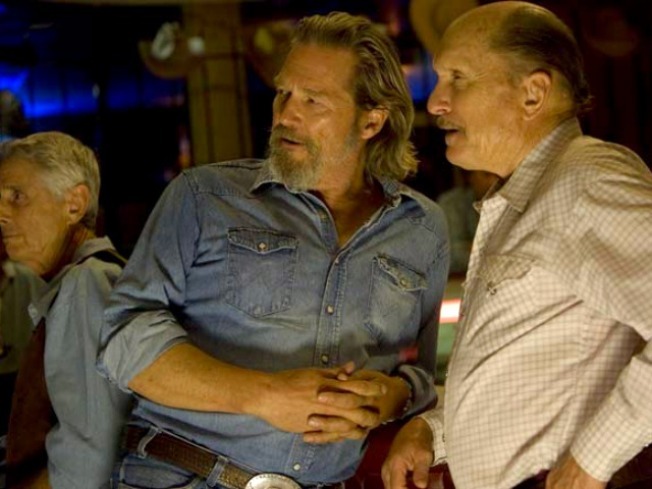 Jeff Bridges hopes follow in the footsteps of his Crazy Heart co-star and producer Robert Duvall, who won an Oscar more than 25 years ago for playing an alcoholic country singing in Tender Mercies. "I’ve been drunk and hungover and puked and all that stuff, so I know how to do that," laughed Jeff Bridges in discussing how he prepared for the role of bloated, alcoholic country singer Bad Blake in "Crazy Heart." But there’s more to Bad than McClure’s whiskey, touches that helped bring the image of a road weary man into focus, like his perpetually undone belt. Each time we see Bad emerge from his truck, his buckle hangs open, his gut putting undue stress on his zipper. "That (touch) was me – that’s what I do when I’m fat and I’m driving," explained Bridges with another chuckle. Gaining 25 pounds for the role was something that he found easier to do than undo. "Eat that extra pint of Häagen-Dazs, have that extra drink … the weight comes on pretty quick," explained Bridges. "Then getting it off, it's tougher each time." It was the late Stephen Bruton who, in addition to providing much of the film’s music, offered pieces of his own life on the road. "Stephen was probably my biggest role model," said Bridges, says of his old friend who died of throat cancer in May. "I remember one writing session we were sitting around and he said, 'You know, when I’m traveling around, I don't stop to take a leak. I'll carry a bottle.'" The image of Blake emerging from his truck, pants open wide, to empty his urine jug, is as grim as it is funny. With a budget of only $7 million, "Crazy Heart" was, by necessity, a grueling shoot with more than 140 scenes to do in only 24 days. Judging by Bridges’ performance, it was worth it. Folks are calling him a shoe-in for yet another Oscar nod. While he enjoys the praise on a personal level, he seems more grateful for what the attention means for the film. "It feels great to be appreciated, that feels wonderful," said Bridges. "And with a movie like this, that doesn't have too much money to get TV ads and print ads and stuff, you’ve got to look at other ways to bring people to the show. And certainly doing festivals and winning awards, that makes the movie stand out, so that’s a good thing."